This year’s cruise ship star has got to be Oceania Cruises’ new Marina. By outscoring all three of her stable mates from Regent as well as her three fleetmates at Oceania, she has managed to propel herself into the five-star league to be rated number 18 out of 285 ships scored in this year’s “Berlitz Complete Guide to Cruising & Cruise Ships.” At the same time, however, we wonder why two ships that have changed ownership and operation and a third that has not even changed her name yet end up with identical scores before and after the changes. Elsewhere, the US Gulf ports of New Orleans and Galveston have both greeted big new ships this weekend, with the Voyager of the Seas at New Orleans and the brand-new Carnival Magic greeted by Maroon 5 at Galveston. Meanwhile, as Seattle treads water in 2011, Vancouver has seen a 15% increase in cruise passengers with Oceani’s Regatta, the Disney Wonder and the Crystal Symphony bringing new business. Next year, however, will likely see Vancouver tread water while Seattle makes the gains, most notably with the defection of Disney Wonder from Vancouver to Seattle in 2012. 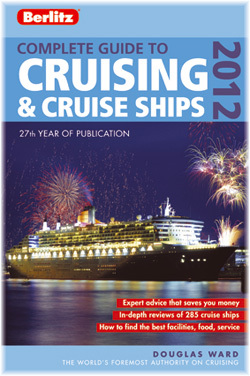 The latest edition of the “Berlitz Complete Guide to Cruising & Cruise Ships” by Douglas Ward has just arrived. A mammoth tome, as usual since the huge growth of cruising has taken place, it has still managed to slim itself down this year, from 722 pages to 690. Now in its 27th year of publication, one of the more interesting points about this issue is that Oceania Cruises’ new Marina has joined the top ten mid-size cruise ships (600-1600 berths) in terms of points, with her score score of 1701 being exceeded only by Crystal Serenity at 1717 and tied by Crystal Symphony, all of which have been awarded five stars. This means that the Marina has also joined Hapag-Loyd’s Europa, scoring 1852 and alone in the five-stars-plus category and top of the tops since she was first introduced, and a small number of other ships at the top of the league, rating a very creditable number 18 out of the 285 ships scored this year. In the small ship category (200-600 guests) all ten top ships scored above 1750 and in the boutique category (50-200) five out of ten scored above 1701. In the large ship category, only Queen Mary 2 achieved five stars for its Grill Class, at 1702. At 1701, Marina has even outscored Regent’s Seven Seas Voyager (1654) and Seven Seas Mariner (1651), which ironically puts those all-inclusive ships into the four-stars-plus category while the extra tariff Marina receives a full five stars. Her 1651 compares well with 1611-12 scored by Celebrity’s four “Solstice” class ships. Indeed, the Marine outscores the Seven Seas Voyager in every category except entertainment, where she falls just one point short of the Voyager. One peculiarity brought out by the guide is how fully fifteen of the eighteen best luxury ships according to Ward, or more than 80%, have names that begin with the letter “S” – is there something a psychologist is not telling us here? The only ships in this category that don’t begin with “S” are the Europa and the two Crystal ships. Back to the Berlitz Guide, also new this year is Cunard’s Queen Elizabeth, whose Grill Class scored her 1690, for four-stars-plus, exceeding slightly Queen Victoria’s 1671. And new to the top ten boutique ships this year is Hapag-Lloyd Cruises’ Bremen, scoring 1553, well up from 1461 last year. The Bremen went up in points in all categories, but particularly in cruise experience, where she was up 14%, and food, where she gained 5%. By comparison her five-star fleetmate Hanseatic scored 1746, for five stars. Also new this year, in big ships, Celebrity Silhouette at 1612 and Disney Dream at 1555, both at four-stars-plus, Mein Schiff 2 at 1548, Allure of the Seas at 1528, Queen Elizabeth (Britannia Class), at 1493, AidaSol at 1490 and Costa Favolosa at 1447, all at four-stars. In the mid-size category, there was notable improvement in the scores of Azamara Quest (1562 as against 1466) and Azamara Journey (1561, up from 1465), which took both ships from four stars into four-stars-plus since they were rebranded as Azamara Club Cruises. Newly rated Adonia came close at 1540, but scored just four stars. In small ships, Seabourn Quest came in with a score of 1787 for a solid five-star rating. while French twins L’Austral and Le Boréal came in at 1543 each, for four-star status, and Aegean Odyssey scored 1341 for a three-stars-plus. One surprise, however, is that a ship called the Hamburg that is not sailing yet scored 1398 points for three-stars-plus. That ship is still sailing today as the Columbus for Hapag-Lloyd and will have a complete change of crew when new operators Plantours take her over in six months time, so we fail to see how Berlitz managed to score her in advance. Perhaps more deserving of a “Not Yet Rated” score we should think. In the same way, two other ships, Spirit of Oceanus, now trading as Sea Spirit, and Clelia II, now trading as Orion II, seem to have come through their changes of identity with identical scores of 1222 and 1402, respectively, after a change of ownership and areas of operation. All in all, however, the “Berlitz Complete Guide to Cruising & Cruise Ships” is well worth the money and answers many of the questions the cruise lines, or even some cruise agents, won’t answer. Both New Orleans and Galveston celebrated the arrival of new ships this weekend as New Orleans greeted Royal Caribbean International’s 137,280-ton 3,114-berth (3,838 with upper berths) Voyager of the Seas on Saturday and Galveston welcomed Carnival Cruise Lines’ 128,251-ton 3,646-berth (4,631 with uppers) Carnival Magic on Sunday. This ship’s US debut was marked with a concert by three-time Grammy Award-winning band Maroon 5. What’s more, the replacement for the Voyager of the Seas, sister ship Mariner of the Seas, arrived in Galveston on Friday, making it a combined three-ship arrival this weekend. The brand-new Carnival Magic arrived at Galveston after a 16-night Transatlantic crossing from Barcelona, where she had spent the summer, and berthed at the newly improved ($12 million worth) Texas Cruise Ship Terminal on Pier 25. The Magic is due to run weekly 7-night cruises from Galveston year-round and joins the 101,509-ton 2,758-berth (3,473 with uppers) Carnival Triumph, which arrived about a month ago to start a series of 4- and 5-night Western Caribbean cruises. Galveston is undergoing a bit of a cruise boom, as not only has Royal Caribbean moved its Mariner of the Seas to Galveston to free the Voyager of the Seas to go to New Orleans, but from September 2012, Disney Cruise Line will base its 83,338-ton 1,750-lower berth (3,325 when all berths are full) Disney Magic at Galveston for the first time. 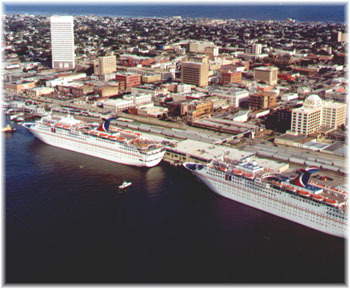 And Princess Cruises will resume cruising out of Galveston after a five-year absence when it moves its 116,000-ton 3,114-berth (3,782 with uppers) Crown Princess to the port in December 2012. The arrival of the Voyager of the Seas marked the return to New Orleans of Royal Caribbean International, which had last cruised from there in 2007. Her arrival for a season of winter cruises brings the New Orleans-based cruise ship fleet back to the level it was at before Hurricane Katrina. With New Orleans greeting the Voyager of the Seas a day before Galveston greeted the Carnival Magic, New Orlans is actually taking on part of the previous Galveston fleet. Not only did the Voyager of the Seas arrive from Galveston, but so will the 110,239-ton 2,974-berth (3,700 with uppers) Carnival Conquest, which will join the 70,367-ton 2,054-berth (2,634 with uppers) Carnival Elation to operate year-round schedules. The Carnival Conquest will look after the 7-night market while Elation operates 4- and 5-night cruises to Cozumel. 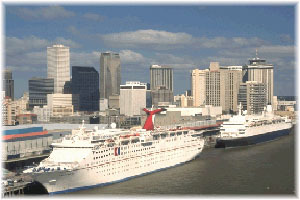 Norwegian Cruise Line’s 75,338-ton 1,976-berth (2,475 with uppers) is also based in New Orleans. The Spirit will be replaced next autumn by the 91,740-ton 2,244-berth (2,846 with uppers) Norwegian Star. This month, the Port of Vancouver reported a successful 2011 Alaska cruise season, posting a 15% increase in passengers over 2010. Between May and October, Vancouver welcomed 663,425 passengers over 199 cruise ship calls. There is an interesting statistic here as while the average ship turnaround at Vancouver handled 3,334 passengers (1,667 each way), the average in Seattle was 4,520 (or 2,260 each way). Therefore, although Vancouver had three more ship calls than Seattle, the average ship size at Seattle was over 35% larger, at least in terms of passengers carried. New to Vancouver in 2011 were Disney Cruise Lines’ Disney Wonder and Oceania Cruises’ Regatta, both sailing from Vancouver on inaugural Alaska seasons. 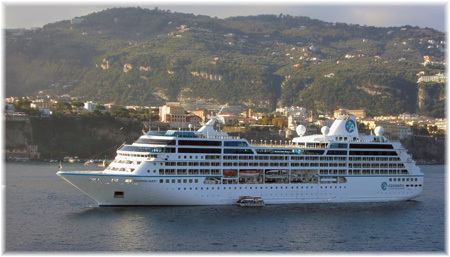 Crystal Cruises also returned, with ten calls by the Crystal Symphony. The 2011 season also marked the second full year of operations of the award-winning shore power installation at Canada Place. Cruise ships can plug in and shut off their engines while docked to reduce emissions. During the season just finished, 35 ships connected to shore power, reducing greenhouse gas emissions by 1,318 tonnes. 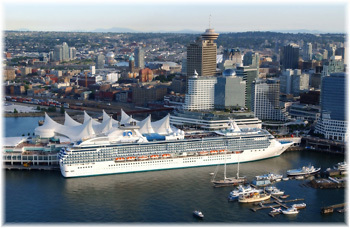 During the 2012 Vancouver-Alaska cruise season, Vancouver expects to host approximately 670,000 passengers on 191 ship calls, including Princess Cruises’ Sapphire Princess, which returns in 2012. But except for two pre- and post-season calls, Vancouver will be losing the Disney Wonder to Seattle.